You don’t need Irish luck to buy a fishing license! It doesn’t take the luck of the Irish to remember to buy your 2018 Alaska sport fishing license! And, it is never too early to purchase your license since there are plenty of opportunities to get out fishing no matter the season. Plan a license-buying party by gathering your family and friends together while you all buy your licenses online while simultaneously planning for some amazing days on the water in 2018! Buying an online fishing license and king stamp is easy. It’s as simple as visiting the Alaska Department of Fish and Game website, and within minutes you’ll be done. And, you can even print your license at home. It’s easy as 1-2-3. Simply go to the online store www.adfg.alaska.gov/Store/, establish a myADF&G profile, select the type of license you want to buy and you’re there. Oh, right after you put in your credit card information. Why are we recommending a myADF&G profile? It will make future license purchases easier, especially if you need to print off a duplicate license, and, we can help remind you if you have a harvest report due. Our goal is to help make your license buying process easier and more efficient, today and in to the future. Do you regularly check the Division of Sport Fish website to catch up on your favorite weekly area fishing report? Have you ever wondered if you are up-to-date on any potential Emergency Order’s that might have been issued for your favorite river? The division can keep you informed if you subscribe to receive our email notifications! The Division of Sport Fish now has an email subscription service that allows anyone to sign up to receive emails on topics that they have pre-selected. We currently offer 40 different subscription options that include area weekly fishing reports and news releases from across Alaska. Don’t be left wondering if you have the most current information! Simply follow this link to subscribe: public.govdelivery.com/accounts/AKDFG/subscriber/new Once subscribed, you can choose what information you want to receive, and how often you receive our emails – immediately or in a daily or weekly digest. Don’t worry, it’s easy to add or delete subscription topics, or to unsubscribe. If You’ve Got the Time, We’ve Got the Lake! March is a great time to get outside and enjoy the longer days and warming temperatures. We’ve put together a list of some of our favorite winter fishing spots to help you plan a day out hard-water fishing. Located in North Pole, Chena Lake is a 259-acre, man-made lake managed by the Fairbanks North Star Borough. The department stocks the lake with Arctic char, landlocked king and silver salmon, and rainbow trout. Chena Lake’s bottom contour is complex with seven basins, ample number of steep banks and good structure such as many jutting points of land and several islands. Maximum dept is 38 feet. Try using small pieces of shrimp on a size 8 or 10 hook. Salmon eggs are also a good choice. Here's a great story about a recent day on the Chena Lake ice. Dolly Varden are Southeast Alaska’s premier early spring sport fish and can be found in most waters throughout the region. Relatively easy to catch and delicious, many anglers overlook this fish! 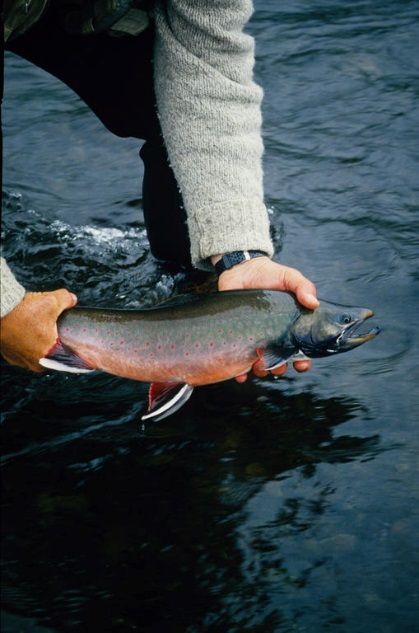 In April and May, Dolly Varden are exiting freshwater lakes where they over-winter and can be found near lake and stream outlets and estuary areas. After a long winter under the ice, they are hungry and ready to eat. This makes them aggressive feeders as they enter salt water, creating ideal sport fishing conditions. They often are found traveling back and forth in front of a stream outlet searching for out-migrating pink and chum fry and will strike at almost anything. Casting small lures like spinners, Super Dupers™, Krocodiles™, and Kastmasters™ or fry patterns is effective. While commonly caught Dolly Varden (5-6 year-old fish) are 12-16 inches long and weigh around a pound, they can reach 10 to 11 years and weigh up to 8 pounds. A beautifully colored salmonid, they have a distinctive appearance, with olive green silvery sides, pinkish spots and white tipped fins. The flesh of a Dolly Varden that has been in saltwater is pink, firm and full of flavor. They are excellent smoked or cooked in the hot coals of a beach fire. All they need is a little salt, pepper, butter and lemon juice. Ice fishing in the Mat-Su Valley is a fun winter activity. March and April typically bring warmer temperatures to the Valley and fishing success seems to increase during these months. Ice safety is the most important factor to consider before going ice fishing. Here are a few stocked lake suggestions to consider when planning your next ice fishing trip. The Mat-Su Valley offers probably some of the best stocked lakes ice fishing opportunities in the state. Anglers will find ample opportunity to access some fantastic lakes close to the rural areas of Wasilla and Palmer. Below are four lakes that provide consistent action and a shot at some bigger fish. A short distance from the Palmer State Fair Grounds. Good for rainbow trout and grayling. This lake is a great location for anglers who are looking for a lot of action. Close to Palmer, easy access, and this lake holds some nice Arctic char. Fish on! Another lake close to town that offers the potential for a lot of fish. Memory Lake is a great option for those wanting to take a shot at catching a few northern pike. Pike are an invasive species in Southcentral and occur in Memory Lake alongside some fairly nice rainbow trout. Anglers may use up to five lines when fishing for northern pike through the ice at Memory Lake. Be sure to check the regulations for more information. Some lakes in the Valley (or just outside the boundaries of the Valley) offer anglers a shot at both stocked and wild fish. Stocked with Arctic char and rainbow trout. Also present are wild populations of burbot and lake trout. 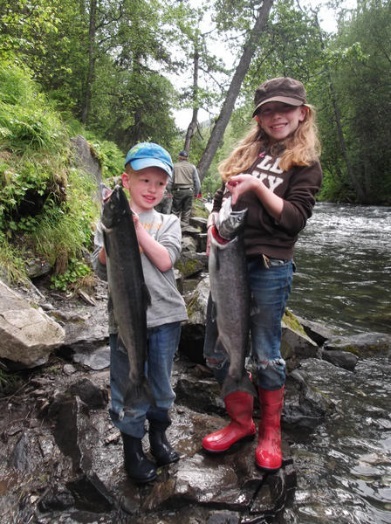 For a more complete list of stocked lakes, visit our Mat-Su Valley stocked lakes pages. Now, it’s up to you. Get out and fish! 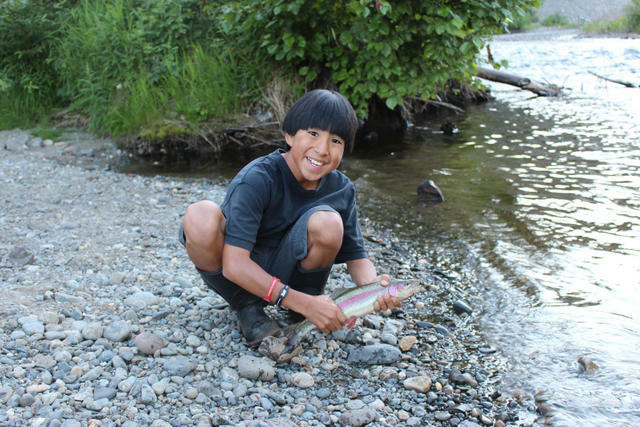 Be sure to share your story on social media using #wefishak. Sauté the chopped onion in 2 tablespoons butter until soft. Remove from pan and add the remaining butter to the pan. Dust the fish fillets with the flour mixed with pepper. Sauté the fillets quickly until they flake. Remove to a hot platter. Return the onion to the pan and reheat. Add the curry powder and blend well. Gradually stir in the sour cream and heat, but do not boil. Check seasoning, pour sauce over the fish fillets and serve with wild rice.